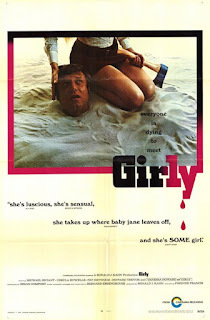 Tag line: "She takes up where Baby Jane leaves off!" Inside a decaying British mansion lives one of the strangest families you’re ever going to meet. Mumsy (Ursula Howells) is the head of this particular clan, and as such sets the rules for the entire household. Her servant, Nanny (Pat Heywood), does most of the housework, and keeps a watchful eye on Mumsy’s “little angels”, Sonny (Howard Trevor) and Girly (Vanessa Howard). Despite being teenagers, Sonny and Girly still enjoy children’s games, and every so often bring a “friend” home to play. But as their newest playmate (Michael Bryant) will soon discover, once you’ve been invited into their abode, Mumsy, Nanny, Sonny and Girly will see to it that you never leave again! Directed by Freddie Francis, 1970’s Girly (released in its native UK as Mumsy, Nanny, Sonny and Girly) is a brilliantly twisted tale of family life gone haywire. The mix of characters is what makes this film work as well as it does, with each member of the cast doing a fine job in their respective roles. Mumsy is the sweet, yet forceful matriarch, setting the rules that all must live by, then ensuring that everyone, including their “guests”, adheres to them (even if Nanny can knit faster than Mumsy, she mustn’t do so because the rules state that Mumsy will always knit more rows each night than Nanny). Though treated as a servant, Nanny is nonetheless a part of the family, and at times even reminds Mumsy of the rules, especially when it comes to their new guest, who Mumsy fancies (per the rules, it’s forbidden to get emotionally attached to a guest). Of the two kids, Sonny is the most child-like, but is also the one who handles the dirty work. When the children tire of their old playmate (Hugh Amrstrong), who, based on his unkempt appearance, has been with them for quite some time, it’s Sonny who sends him to the “angels” (by way of his trusty bow and arrow). Yet the two most interesting characters in the film are Girly and the family’s new friend, who they refer to as “The Guest in #2”. As played by Vanessa Howard, Girly can be as mischievous as Sonny, as vindictive and strong-willed as Mumsy, and as vulnerable as a young lady coming to terms with her budding sexuality. Howard’s finest moment occurs during a one-on-one with the Guest in #2. In an old stable house, away from the prying eyes of Mumsy, Nanny, and Sonny, the Guest in #2 seduces Girly, and for most of the encounter the camera stays focused on Girly’s face, which, in this brief scene, conveys a range of emotions (fear, excitement, joy, and even a little sorrow). For Girly, this “romance” signals her maturation into a young woman, but for Michael Bryant’s Guest in #2 (who has tried to escape once, and failed), the seduction of Girly is part of his grand scheme to bring this “happy” family down from within. Already involved in a sexual relationship with Mumsy, the Guest in #2 has, by way of his tryst with Girly, managed to turn mother and daughter into romantic rivals, and before long will also make a play for Nanny. By stirring up jealousy and mistrust, he gets closer to the freedom he so desires, and watching him subtly pit one against the other is arguably the movie’s biggest strength. Equal parts humorous and disturbing, Girly fits neatly into both the comedy and horror genres, but is by no means a conventional entry in either one. What it is, though, is a wonderfully satiric take on the “traditional” family unit, and a black comedy that will keep you laughing nervously throughout.